Two years later, the results of President Trump’s decision not to divest would likely astound even those most dismayed by his original announcement. The conflicts of interest the president has caused are nothing short of an ethical catastrophe. During President Trump’s second year in office, CREW recorded more than 900 interactions between the government, those trying to influence it, and the Trump Organization, each resulting in a conflict of interest for President Trump. Those instances bring the total number of known conflicts of interest involving the Trump Organization to more than 1,400, two years into the Trump administration. CREW identified these conflicts by reviewing news reports, public documents, newsletters, and social media, including a Twitter account that tracks who’s going to Trump’s properties. The Trump administration’s treatment of the president’s properties as de facto extensions of the White House has not been lost on special interest groups seeking to influence the government. In fact, these groups seem to have gotten the message loud and clear. During President Trump’s second year in office, CREW tracked 20 special interest events and three foreign government events that were held at President Trump’s properties, resulting in payments to the president. To be clear, this amounts to the president of the United States receiving a direct and significant financial benefit from special interests, foreign and domestic, that have chosen to spend money on events at his properties to curry favor with his administration. In many cases, special interest groups’ spending at President Trump’s properties coincided with influence-seeking efforts with his administration. In August, CREW found that since President Trump took office, at least 13 special interest groups have lobbied the White House around the time they patronized a Trump property. For example, the American Petroleum Institute, an oil-industry lobbying group, held a two-day board of directors meeting at Trump International Hotel – Washington, DC in March. On the second day of the event, energy executives attending the event traveled to the White House to meet with President Trump and Vice President Pence on trade issues. That same month, the Independent Petroleum Association of America held a three-day event at the hotel, and planned to lobby the EPA on the last day. The Seasonal Employment Alliance likewise sought White House influence soon after holding a February event at the president’s DC hotel. Less than two months later, the group hired Cove Strategies, whose co-founder, Matt Schlapp, is married to a senior White House official. Schlapp then lobbied the Executive Office of the President on behalf of the group that same quarter, the first time the Seasonal Employment Alliance had ever lobbied the White House. Having an event at a Trump property has also afforded special interests access to high-ranking officials in the Trump administration, including President Trump himself. For example, Energy Secretary Rick Perry and then-Interior Secretary Ryan Zinke were both scheduled to attend the American Petroleum Institute’s annual board meeting at the Trump hotel in March. In November, a pro-Israel political group that held an event at Mar-a-Lago was “blessed to have President Donald Trump come in and… thank everyone that was there,” according to a speaker. 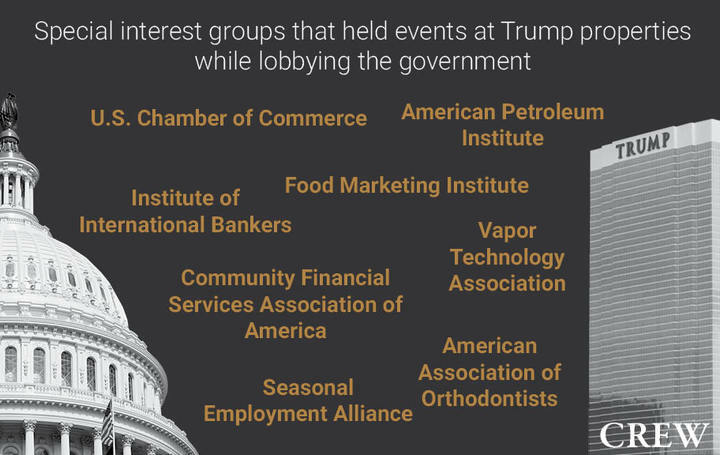 Groups representing the pharmaceutical, vaping, and payday loan industries also held events at Trump properties during President Trump’s second year in office, resulting in personal income for the president. President Trump’s refusal to condemn white nationalist violence in Charlottesville in August 2017 caused a number of charity and other groups to cancel events at Mar-a-Lago. In place of these events, pro-Trump groups have held events at Mar-a-Lago that are explicitly supportive of the president. One of these groups, Trumpettes USA, was given a discount by the president’s club for its January event. In addition to special interest groups, Kuwait, the Philippines, and Romania all held events at Trump properties during President Trump’s second year in office. These events are likely to have resulted in illegal payments by foreign governments to the president. The Kuwaiti embassy celebrated its independence at the Trump International Hotel – Washington DC for the second year in a row in February. The event had been held at the Four Seasons for the past ten years but was relocated after President Trump was elected. Counselor to the President Kellyanne Conway attended the event, giving the foreign government access to a high-ranking White House official at an event for which they had presumably paid her boss a hefty sum. “It’s a statement that we have a good relationship with this president,” he said. The ambassador denied that public funds were used to sponsor the event, claiming instead that private donors had paid for it. Finally, in November, the Romanian consulate in Chicago celebrated its national day at the Trump International Hotel and Tower – Chicago. The event was attended by more than 300 people, including Romanian and Dutch government officials as well as elected officials from the state of Illinois. Like Kuwait, the Romanian consulate had consistently held its event elsewhere for the previous five years before switching the venue to one from which the president receives personal income. A federal judge ruled in July that payments from foreign governments to President Trump through his businesses are foreign emoluments, which the Constitution bars the President from receiving without approval from Congress. Despite the ruling, this year’s data demonstrates that President Trump shows no signs of discouraging what is effectively an avenue for unaccountable, largely untraceable money from special interests and foreign governments to fill his and his family’s own bank accounts. While holding office has had mixed effects on the success of President Trump’s businesses, it has unequivocally resulted in more business from political groups. Since President Trump took office, political committees have showered his businesses with cash. Rather than holding him accountable for his unprecedented decision not to divest from his company, President Trump’s political allies have embraced the arrangement, channeling millions in political money to his properties. 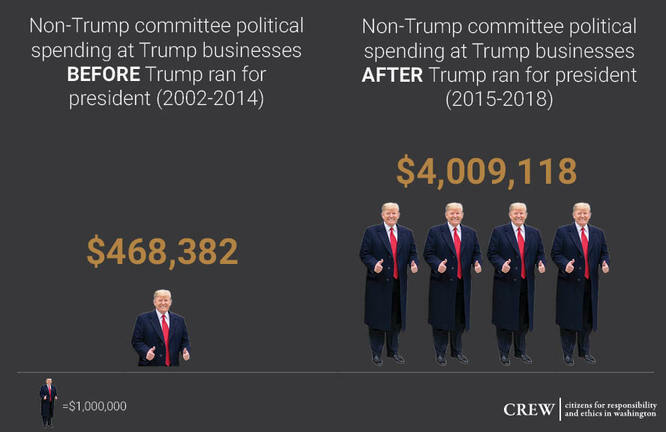 Before President Trump announced his presidential campaign, political committees had never spent more than $100,000 total at Trump properties in any year, going back at least as far as 2002. Since President Trump took office, however, political groups have spent $4.9 million at the president’s businesses, with $3.8 million coming from political groups other than President Trump’s reelection campaign. 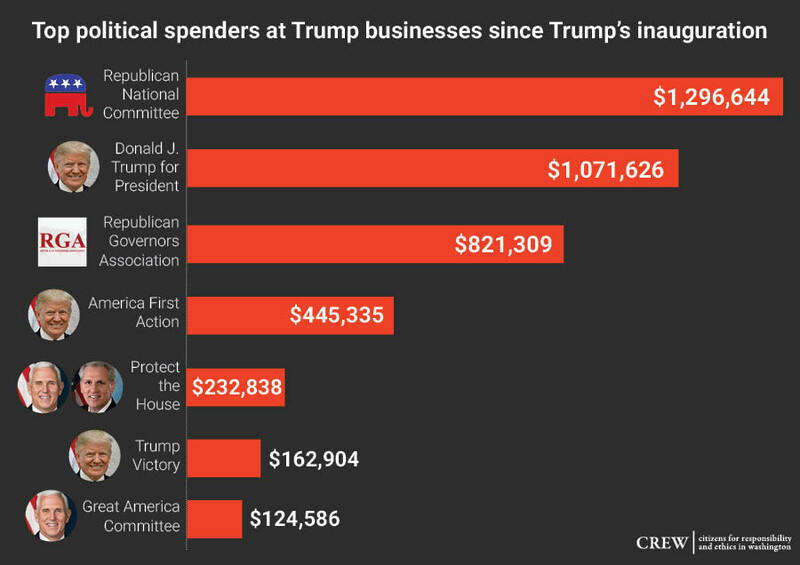 These totals only include amounts that can be tracked in filings submitted to the Federal Election Commission (FEC) or the IRS and are, therefore, only a sliver of what various interest groups are spending at Trump-brand properties. For example, nonprofit organizations—some of which spend heavily on politics without disclosing their donors—don’t have to file detailed spending reports that are available to the public, and thus their contributions to the Trump Organization’s balance sheets can’t be tabulated. More than 150 political committees have made a payment to a Trump business since President Trump was inaugurated. The top spenders over this period have been the Republican National Committee ($1.3 million), the Trump campaign ($1 million), the Republican Governors Association ($821,309), pro-Trump super PAC America First Action ($445,335), and Protect the House ($232,837), a joint fundraising committee that sought to keep the House in Republican control. Three Trump properties in particular have emerged as prominent fundraising venues, resulting in large payments to each. Republican political groups have paid $1.9 million to Trump International Hotel – Washington DC, $1.4 million to Trump National Doral, and $459,715 to Mar-a-Lago since President Trump took office. The 2018 midterm elections caused political groups to ramp up political events and spending at President Trump’s properties. CREW tracked 33 political events that were held at a Trump property during President Trump’s second year in office. According to CREW’s tracking, the RNC held five events at three different Trump properties over this period, and Protect the House has held four events at two of them. America First Action and Vice President Pence’s PAC, Great America Committee, hosted two events each at Trump International Hotel – Washington DC. In many instances, holding an event at a Trump property afforded political groups and their donors access to high-ranking officials in the Trump administration. According to CREW’s tracking, President Trump attended 13 political events that were held at his properties during his second year in office and dropped by to greet attendees at a fourteenth. Vice President Pence attended nine political events at Trump properties over this period. Offering donors access to high-ranking officials resulted in big fundraising totals for these political groups and lots of income for the president. In October, three House challengers hosted a fundraiser at Trump International Hotel – Washington, DC where donors who gave $20,000 were allowed to participate in a private roundtable with the president. A committee raising funds for the event brought in $285,000, roughly $40,000 of which was paid to the president’s business. In addition to affording political groups and their donors access to the president, spending at Trump properties seemed to coincide with an additional benefit during President Trump’s second year in office. Fast Company reported in October that President Trump had tweeted an endorsement for eight candidates after they spent money at one of his properties. As President Trump set U.S. foreign policy as head of state, the Trump Organization continued to do business in—and in some cases with—foreign countries across the globe. Each interaction between a foreign government and the Trump Organization results in a conflict of interest for the president, who still owns and profits from his businesses. Some foreign governments may view doing favors for the Trump Organization as a way to curry favor with President Trump. In February, Fast Company reported that the government of the Dominican Republic, where the Trump Organization is reportedly involved in developing a resort, had introduced a proposal increasing limits on the height of coastal buildings. The Trump Organization’s business partner there had requested the change. An unnamed aide in the country’s tourism ministry said, “It’s on everyone’s mind—that this will help…Trump.” Authorities in Indonesia and Panama planned infrastructure changes that would benefit Trump-branded developments during President Trump’s first year in office. President Trump’s businesses received trademark approvals from the governments of Brazil, Peru, Canada, and China this year. Peru granted him four trademarks just four days before he was scheduled to travel to the country for a diplomatic visit that included a meeting with Peruvian President Pedro Pablo Kuczynski. President Trump’s visit was canceled at the last minute, the day after his businesses received the four trademarks. During his first year in office, President Trump received trademark approvals from China, Mexico, and Macau. Trump himself has reinforced the idea that the Trump Organization is an extension of the Trump Administration. Reports this year said President Trump brought up his international businesses in Panama and Scotland in private exchanges with both U.S. and foreign officials. The Trump Organization has embraced its links to power in foreign dealings. During a February sales trip to India, Trump Organization Executive Vice President Donald Trump Jr. planned to give a foreign policy speech on “Indo-Pacific Ties” at an event that featured Indian Prime Minister Narendra Modi. The blurred lines between the president’s business and his administration provoked a backlash, and the speech was cancelled. While some foreign countries have appeared to court favor with policies that benefit President Trump’s properties, others have simply handed over the cash. This year, Qatar purchased a fourth unit in Trump World Tower; Kuwait, Romania, and the Philippines hosted events at Trump properties, as detailed above; and the Saudi Crown prince’s visit to New York City caused such a windfall for the Trump International Hotel there that the general manager credited the visit to explain a rise in rental revenue to investors. 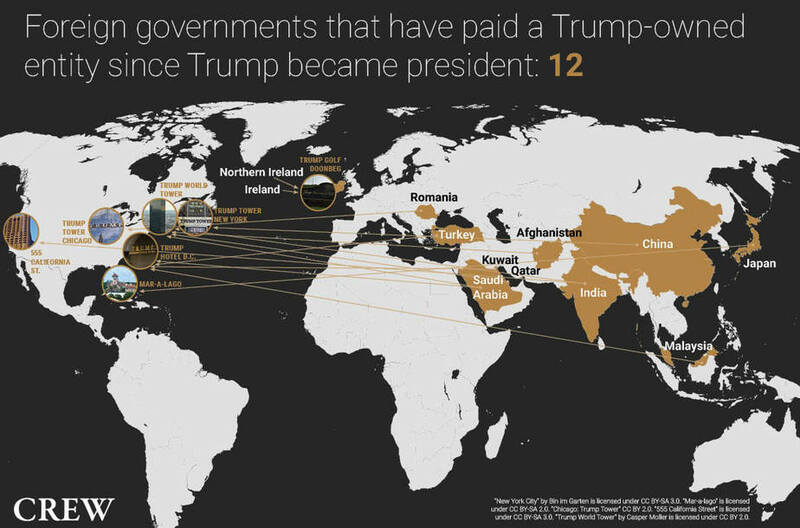 In the first two years of the Trump administration, CREW has identified 12 foreign governments that have made payments to President Trump possibly in violation of the foreign emoluments clause of the Constitution. While President Trump promised not to participate in “new foreign deals” while in office, his business partners abroad have continued to do business with foreign governments on developments that will bear his name. Chinese government-owned construction companies made agreements to work on projects that will include Trump-branded elements in Indonesia and Dubai this year. In September, a construction firm in which the Saudi government owns a large stake signed an agreement to work on a Trump-branded development in Indonesia. The agreement was signed just three weeks before journalist Jamal Khashoggi disappeared after entering the Saudi consulate in Istanbul. President Trump has refused to hold the Saudi government accountable for the journalist’s death despite the Central Intelligence Agency’s assessment that the Saudi government ordered his brutal killing. An official speaking on behalf of the Saudi-owned company has said it expects to be contracted to work on an additional Trump-branded development in Indonesia in the future. Additional conflicts related to foreign governments are on the horizon in 2019. The state-owned Bank of India and the government-controlled and majority-owned Industrial & Commercial Bank of China both rent space in Trump properties. Both banks’ leases expire next year, putting the two countries in a position to negotiate their payments to President Trump, maybe even with his sons. During the second year of the Trump presidency, President Trump and members of his administration continued to promote the Trump brand in their official capacities by mentioning or referring to Trump Organization businesses in public statements, tweets, and responses to reporters. The administration’s promotion of Trump properties and brands significantly increased over the past year relative to the year before, a trend that CREW noted in August. This year, President Trump and other White House staff members promoted Trump businesses on at least 87 occasions, up from last year’s total of at least 54. The administration’s most enthusiastic promoter of the Trump brand this year was, perhaps unsurprisingly, the president himself. On Twitter and during public appearances this year, President Trump mentioned his private businesses at least 68 times—more than double last year’s total of 33 mentions of Trump businesses by the president. On Twitter, at least 16 posts from the president’s @realDonaldTrump Twitter account this year mentioned or praised Trump businesses, including two retweets of posts from official Trump Organization Twitter accounts. It’s one thing for the president to tweet about his businesses during “executive time,” but around three-quarters of instances of promotion by President Trump over the past year involved the president mentioning his businesses during press conferences, speeches, and public remarks, often explicitly endorsing the properties he still profits from. In many of these cases, President Trump’s businesses were largely unrelated to the topics officially being discussed at the time. While hosting a “Small Business Tax Roundtable” in Florida last spring, for example, the president brought up the Trump National Doral Miami golf club in order to note his affinity for the Venezuelans who live in the area surrounding the resort. In June, while addressing the White House press pool on Air Force One, President Trump reportedly invited the reporters to his golf club in Bedminster, New Jersey, mentioning the fact that a PGA Championship will be held at the club in 2022. In August, he mentioned Trump Tower in New York City at length during a meeting with religious leaders at the White House; as the New York Times later wrote, “it was unclear why he chose to discuss [the building].” During a wide-ranging interview with Bloomberg later the same month, President Trump mentioned “the great [Trump] Turnberry,” as well as his Aberdeen and Doonbeg golf resorts. President Trump did not shy away from promoting his businesses during diplomatic meetings with international organizations and foreign heads of state, doing so on at least 11 occasions this year. While meeting Irish Prime Minister Leo Varadkar in March, the president referenced his Doonbeg golf resort as well as Trump Tower in New York. During a working lunch with Japanese Prime Minister Shinzo Abe at Mar-a-Lago in April, President Trump called the Palm Beach resort “a special place… somehow it makes people feel good.” Over the course of his July visit to the UK, the president mentioned his Doonbeg golf club during a NATO press conference, discussed Trump Turnberry during a joint press conference with British Prime Minister Theresa May, and reportedly “boasted” about his UK properties during other conversations with the prime minister. Not even solemn occasions stopped the president from talking about his private businesses. On the same day that the late Sen. John McCain lay in state at the Capitol in August, President Trump visited Charlotte, North Carolina and praised his Trump National Golf Club near the city, calling it “a very big success.” In September, while being briefed on the aftermath of Hurricane Florence, the president made a point of asking about the condition of Lake Norman, where his North Carolina golf club is located—“I can’t tell you why,” he reportedly said, “but I love that area.” And in October, during a visit to a Red Cross headquarters in Georgia during the Hurricane Michael relief effort, President Trump praised his own prior fundraising efforts for the Red Cross at Mar-a-Lago. Federal law prohibits a government employee from using “his public office for his own private gain or for that of persons or organizations with which he is associated personally.” It also states that “an employee’s position or title should not be used to coerce; to endorse any product, service or enterprise; or to give the appearance of governmental sanction.” However, as President Trump frequently points out, the president is exempt from these rules. Notably, public references to Trump properties by administration members other than the president himself declined this year relative to last year. Still, White House staff mentioned his properties in public at least 16 times, a decrease from the 21 mentions recorded in 2017. Among these references were tweets from the Office of First Lady Melania Trump and White House social media director Dan Scavino featuring photographs of the president’s Bedminster club; in April, a set of Mar-a-Lago photographs were posted on the White House’s website. The administration’s promotion of Trump properties has become so normalized over the last two years that in November, when the White House’s Christmas decorations featured an image of the Trump International Hotel and Tower in Chicago, the Washington Post framed the presence of only one Trump property in the decorations as an act of restraint by the White House. It isn’t just the administration’s promotion of Trump properties that has built them up as centers of power and influence. The special privileges granted to patrons of the president’s businesses have also added to this perception. During the second year of the Trump administration, paying members of President Trump’s exclusive resort clubs often enjoyed close access to the president and his administration, continuing a trend that began in the Trump presidency’s first year. In some cases, club members have even been able to exert a direct influence on administration policy. This influence has not come cheaply: Members of the president’s clubs pay large sums of money in order to gain and maintain their memberships. Reports have cited initiation fees of up to $100,000 for the Trump National Golf Club in Bedminster, NJ and $200,000 for Mar-a-Lago, with the latter fee having been doubled from its previous cost of $100,000 by the club following President Trump’s election in 2016. On multiple occasions last year, the president reached out to his paying customers for advice on high-stakes issues in national politics. When President Trump traveled to Florida in the aftermath of the Stoneman Douglas High School shooting in February, he stayed at Mar-a-Lago and reportedly surveyed club members for their opinions on gun control measures. The next month, following a series of negative news stories about his son-in-law and advisor Jared Kushner, the president reportedly asked Mar-a-Lago members what they thought of Kushner’s bad press during a visit to the club. Beyond simply making suggestions to President Trump, members of the president’s clubs have also had direct influence over his administration’s policies. Extensive reporting over the past year revealed that in 2017, a group of three Mar-a-Lago members inserted themselves into the top rungs of the Department of Veterans Affairs’ decision-making apparatus. Since then, these three men—Palm Beach doctor Bruce Moskowitz, Marvel Entertainment chairman Ike Perlmutter, and lawyer Marc Sherman—have issued de facto orders to high-ranking VA officials, reviewed contracts and budgets, and weighed in on personnel decisions. Early in 2018, when then-Veterans Affairs Secretary David Shulkin came under fire for misusing government funds, he flew to Mar-a-Lago to seek Perlmutter’s support. In the run-up to Shulkin’s subsequent firing, Perlmutter met with President Trump at Mar-a-Lago to discuss “various pressing issues at the VA.” Perlmutter had reportedly recommended a replacement for Shulkin to the president. Shulkin’s eventual successor as Secretary of Veterans Affairs, Robert Wilkie, made a trip to Mar-a-Lago himself in order to meet with Moskowitz, Perlmutter, and Sherman a few weeks after his installment in the position. In an even more blatant elevation of his clubs’ patrons to positions of power, President Trump has also reportedly considered at least four Mar-a-Lago members for ambassadorships since his election. Two of those members, Brian Burns and Patrick Park, withdrew from consideration in 2017. Founding Mar-a-Lago member Robin Bernstein, however, was nominated to be Ambassador to the Dominican Republic in late 2017 and confirmed in June of 2018. Handbag designer Lana Marks, another Mar-a-Lago member, was nominated to be Ambassador to South Africa in November. Even President Trump’s more outwardly innocuous entanglements with patrons of his clubs demonstrate that with membership comes the possibility of access to the president. In June of 2018, the president made a surprise appearance at a wedding being held at his Bedminster country club. In July, BuzzFeed News reported that members of President Trump’s Florida clubs had apparently been invited to an exclusive tour of Air Force One in 2017. In October, the New York Times reported that President Trump had allegedly complained about having to use a government-issued phone because it made it more difficult for him to provide his friends at Mar-a-Lago with his phone number. This revelation emerged in the aftermath of reports that Russian and Chinese spies had exploited the president’s preference for his cell phones in order to listen in on calls from the White House. Despite all this, the Trump administration and Trump Organization still have not published membership lists for the president’s clubs, making it impossible to get a full count of the sorts of conflicts outlined above. President Trump and other government officials continued to visit and patronize Trump-brand hotels and resorts during his second year in office, cementing the properties’ positions as centers of political power and influence under the Trump administration. This patronage was bolstered by the midterm campaign season, which brought a number of high-profile political fundraisers to the Trump Organization’s properties across the country—and with them, many members of government. No government official visited Trump properties more over the past year than the president himself. During the second year of his administration, President Trump spent 96 days visiting his properties, more than one in every four days this year. Often, he visited multiple properties on the same day—golfing at his West Palm Beach golf club during stays at nearby Mar-a-Lago, for example—thus bringing the total count of the president’s visits to his properties during his second year in office up to 118. In total, President Trump has visited one or more of his properties on 217 days of his presidency, totaling 281 visits. President Trump’s visits to his properties mix several aspects of the conflicts of interest and presidential profiteering that are so unique to the Trump era. As noted in the previous section, his wealthy customers get face time with the president of the United States and access to his administration, but his visits, as well as the visits by state level officials, also result in taxpayer money being spent at his properties and serve as free publicity to promote his businesses. The majority of the president’s visits to his properties were to his golf courses, which he travelled to 71 times, according to CREW’s tracking. The golf course that President Trump visited most was the Trump National Golf Club in Bedminster, NJ, his so-called “summer White House,” where he golfed, dined, or stayed on at least 31 occasions over the past year. President Trump also visited the Trump National Golf Club in Potomac Falls, VA, near Washington, DC, on at least 19 occasions over the past year, and he visited his West Palm Beach, FL golf club at least 18 times. In July, the president’s two-night stay at his Turnberry golf course in Scotland marked his first visit to an international Trump property while in office. President Trump visited Mar-a-Lago on 29 days over the past year, down from 49 during his first year in office. This decrease was partially due to the cancellation of his planned 16-day stay at Mar-a-Lago during the Christmas and New Years holidays, as a result of the government shutdown. President Trump also visited his Washington, DC hotel at least 11 times, often for GOP fundraisers. As of the publishing of this report, the president has not been seen dining out at any Washington, DC restaurant other than the hotel’s steakhouse, BLT Prime. Like his first year in office, the president frequently conducted official government business at his properties during his second year in office. In April, President Trump hosted Japanese Prime Minister Shinzo Abe at Mar-a-Lago for two days during a diplomatic visit in which the leaders discussed the Trans-Pacific Partnership. During the United Nations General Assembly session in September, Abe again joined the president for a dinner meeting at Trump Tower in New York City. In June, after Justice Anthony Kennedy’s retirement from the Supreme Court, President Trump floated the idea of interviewing potential successors to Kennedy at his Bedminster golf club—though it is unclear whether any interviews ever actually took place. In August, the president hosted a roundtable meeting on prison reform at Bedminster that was attended by at least 17 government officials, including five governors, two state attorneys general, and several high-ranking executive branch officials. Finally, several of President Trump’s visits to his properties over the past year coincided with events and fundraisers for Republican candidates and committees. In February, the president spoke at the Republican National Committee’s winter meeting, held at the Trump International Hotel in Washington, DC; he also visited Mar-a-Lago in March to attend a reception for “Trump Victory,” a joint fundraising committee for his 2020 campaign and the Republican Party. In April, the president visited his DC hotel for a dinner with political backers hosted by America First Action, a pro-Trump super PAC. In September, President Trump attended a Republican fundraiser at his Las Vegas hotel, as well as fundraising events benefiting the National Republican Congressional Committee (NRCC) and Protect the House, a committee affiliated with the Republican Party and Vice President Mike Pence, at his Washington hotel. And in October, the president headlined a fundraiser for New Jersey Republican congressional candidate Jay Webber and others at the hotel. CREW identified 119 different federal officials’ and employees’ visits to Trump properties during the administration’s second year, with visitors coming from every executive department other than Agriculture and Transportation. This represents an increase relative to the administration’s first year, in which CREW tracked around 70 officials who made visits to Trump Organization properties. Many administration officials were repeat visitors over the course of the year: Vice President Mike Pence and Counselor to the President Kellyanne Conway both stopped by Trump properties at least 11 times, and Press Secretary Sarah Huckabee Sanders visited at least seven times. Out of 186 total recorded visits by executive officials to Trump properties during President Trump’s second year, the vast majority—145 of them—were to the Trump International Hotel in Washington, DC, where book signings and other events hosted by Trump affiliates frequently drew crowds of administration insiders. In July, for example, an event at the hotel promoting a book by Fox News host Jeanine Pirro was attended by at least six executive branch officials, including Jared Kushner, Kellyanne Conway, and Sarah Huckabee Sanders. The release party for former White House Press Secretary Sean Spicer’s book, hosted at the hotel the same month, was attended by at least six executive branch officials as well. And in November, at least eight executive branch officials attended a book party hosted by former Trump campaign officials Corey Lewandowski and David Bossie. Other visits to the hotel from executive branch officials were connected to events held by lobbying groups and special interests. In March, when the American Petroleum Institute held its annual board meeting at the hotel at the hotel, Energy Secretary Rick Perry and then-Secretary of the Interior Ryan Zinke planned to attend. And in September, a gala held by the American Legislative Exchange Council, a conservative policy organization, brought Vice President Mike Pence, Counselor to the President Kellyanne Conway, then-Interior Secretary Ryan Zinke, and DHS Secretary Kirstjen Nielsen to the hotel. Most visits by executive branch officials to the hotel, however, were not connected with particular events; instead, the majority of administration officials’ visits to the hotel seem to have been casual visits and private celebrations, in keeping with the location’s status as the social hub of Trump influencers in Washington. In July, White House Director of Strategic Communications Mercedes Schlapp celebrated her 16th anniversary with American Conservative Union chair Matt Schlapp at the hotel, and at least three members of the White House’s staff celebrated their engagements at the hotel over the past year as well. Executive branch officials also visited Mar-a-Lago 15 times, sometimes in connection with government business: in April, at least nine White House and Cabinet officials travelled to the club to help President Trump during the US-Japanese summit being held there. Another category of visitors that saw a large increase relative to the administration’s first year was members of Congress. During the second year of the Trump administration, CREW tracked 53 members of the Senate and the House of Representatives who visited Trump properties—a more than thirty percent increase over last year’s count of 36 members. Due to several members being repeat visitors, the total count of visits to Trump properties from senators and representatives in the administration’s second year, according to CREW’s tracking, was 90, nearly double last year’s total of 47 visits. Not surprisingly, many of these visits coincided with political fundraisers and events held at Trump properties. As early as late January, then-House Majority Whip Steve Scalise (R-LA) attended a fundraiser at the Trump International Hotel in Washington, DC hosted by two top-ranking Republicans in the Louisiana House of Representatives. On the same day, Senate Majority Leader Mitch McConnell (R-KY), as well as Senators David Perdue (R-GA), Shelley Moore Capito (R-WV), John Barrasso (R-WY), and Dan Sullivan (R-AK), were reportedly set to attend a lunch at the hotel with donors to the National Republican Senatorial Committee. McConnell and Scalise, as well as then-House Majority Leader Kevin McCarthy (R-CA), visited the hotel in January for a fundraiser benefiting Vice President Mike Pence’s Great America Committee. Throughout the rest of the year, many other political events brought members of Congress to the president’s Washington hotel. In June, at least 13 representatives and four senators attended the America First Action Leadership Summit, held over the course of two days at the hotel. Earlier the same month, McCarthy co-hosted a fundraiser at the hotel for Protect the House, a joint fundraising committee he headed with Vice President Pence, which was attended by Scalise, as well as then-Speaker of the House Paul Ryan (R-WI). In September, Ryan, Scalise, McCarthy, and Representative Bruce Westerman (R-AR) attended a dinner with donors at the hotel. Other events often brought members of Congress to Trump properties, as well. In February, Representatives Brian Mast (R-FL) and Ron DeSantis (R-FL) spoke at a gala at Mar-a-Lago held by the pro-Israel Truth About Israel organization. In March, Scalise spoke at an event held by the Independent Petroleum Association of America, an energy-industry group, at the president’s Washington hotel; in June, Representative Ryan Costello (R-PA) addressed a pro-vaping lobby group’s event at the hotel. At least four members of Congress attended Jeanine Pirro’s book signing at the hotel in July. Two senators joined the president at his golf courses: Lindsey Graham (R-SC) in August and October, and Rand Paul (R-KY) in August. 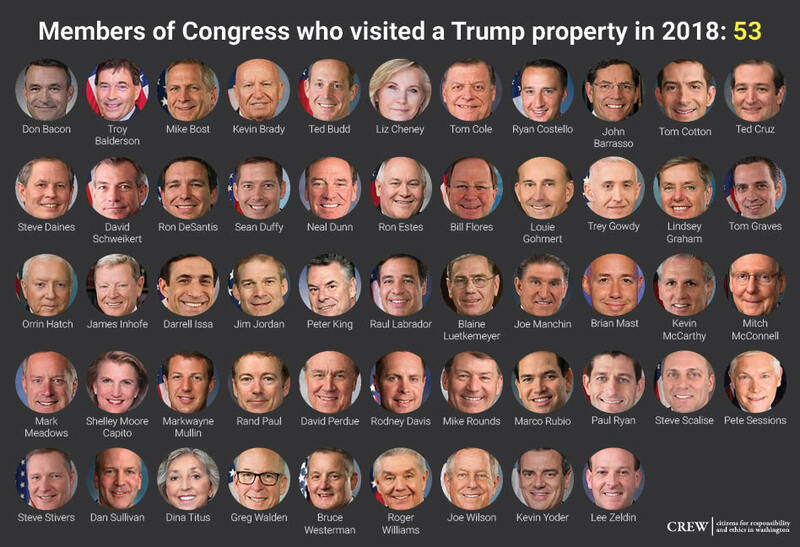 Of all the members of Congress spotted visiting Trump properties last year, the most prolific repeat visitors were McCarthy and Scalise, who each made five visits, often for fundraising purposes, according to CREW’s tracking. Graham, Paul, Ryan, and Representative Darrell Issa (R-CA) came in second place, with four visits each. With a new freshman class joining the ranks of the legislative branch this year, however, these more established members may soon have some serious competition. In the two months between his election in November and his January swearing-in, Representative-elect Dan Crenshaw (R-TX) visited Trump properties twice: once to attend a “Texas Tea” event held at the president’s Washington hotel, and once to attend a gala held by the conservative youth organization Turning Point USA at Mar-a-Lago during the holiday season. Only two Democrats were spotted at Trump properties last year. In May, Representative Dina Titus (D-NV) accepted an award from a Cyprus-focused group at the hotel, and Senator Joe Manchin (D-WV) stopped by in October. Finally, over the past year, at least 33 different state government officials visited Trump businesses. In February, then-Maine Governor Paul LePage was spotted at the president’s Washington hotel—his second visit, after a prior stay at the hotel in 2017. In March, then-Florida Governor Rick Scott was scheduled to attend a Republican Party dinner at Mar-a-Lago. In August, five state governors attended the president’s prison reform roundtable at his Bedminster, NJ golf club; also in attendance were two state attorneys general, including Florida Attorney General Pam Bondi, who famously elected not to pursue action against Trump University. When state officials patronize Trump properties, it can result in state taxpayer money going into the president’s private trust. More details on this may soon be forthcoming. Former Governor LePage left office this month, and a spokesman for his successor, Governor Janet Mills, has said that her administration would address public record requests left outstanding during LePage’s governorship—including the Portland Press Herald’s request for receipts from LePage’s taxpayer-funded stay at the Trump International Hotel. In total, at least nine governors visited Trump businesses over the past year, as well as at least two lieutenant governors. Additionally, at least 15 members of state legislatures visited the president’s properties as well. During President Trump’s second year in office, CREW tracked a staggering array of conflicts of interest involving the president’s private businesses. Still, due to a critical lack of transparency from both the Trump administration and the Trump Organization, this report does not—and cannot—capture the full extent of the ethical crisis that has resulted from the president’s failure to divest himself from his interests in the Trump Organization. The administration has declined to release full White House and Mar-a-Lago visitor records; the Trump Organization has refused to publicly identify members of its exclusive clubs. For these and other reasons, the American public cannot know the true degree to which President Trump’s businesses have interacted with his administration. It is highly plausible, perhaps even likely, that the conflicts outlined in this report are only part of the picture, and maybe just a small part. Despite this, the available facts make a number of conclusions unavoidable. Over the last year, foreign governments, special interests, and political committees spent large sums of money at businesses from which President Trump has refused to divest. As a result of his lack of divestment, the president has profited from these expenditures, creating a massive conflict of interest that is, at best, ethically unacceptable and, at worst, unconstitutional and illegal. At the same time, President Trump and White House officials have actively promoted Trump businesses as centers of power and influence by visiting them, mentioning them in public, and granting special privileges to their dues-paying patrons. Members of Congress have implicitly supported this arrangement by patronizing the president’s properties themselves. As long as President Trump remains invested in the Trump Organization, it is impossible for citizens to know with absolute certainty whether presidential decisions and policy are being made in the best interest of the country or in the best interest of the president’s own bottom line. More than ever, Americans must ask: Is the country’s government being put up for sale? And if so, what are we being sold out for—and to whom?